Most kids might hope to get an Xbox or an iPod Touch for their 10th birthday. 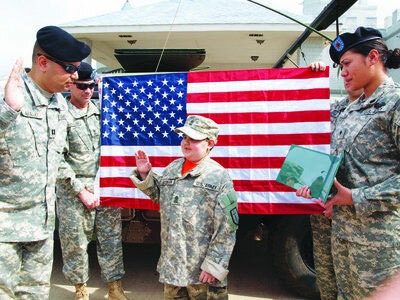 Brennan Daigle got a reception from a formation of soldiers, a ride in a camouflaged National Guard Humvee–and induction as an honorary member of the Army. Since October 2009, Brennan, from Sulphur, Louisiana, has been battling embryonal rhabdomyosarcoma–a rare form of cancer in which muscular tumors attach themselves to bones, writer Rachel Reischling reports in the Fort Polk Guardian. Last month, doctors told his family there was nothing more they could do, and gave Brennan just weeks to live. Becky Prejean, who runs a charity for sick kids called Dreams Come True of Louisiana, heard about Brennan’s illness, and got in touch with his mother, Kristy Daigle. Brennan’s greatest wish, Daigle told Prejean, was to meet some soldiers in person, before his illness worsened. So the two women contacted the Fort Polk Community Relations Office, which put out a call for a few soldiers to attend Brennan’s tenth birthday on Feb. 26. Brennan had been told he was going fishing with his father. But when he got out of his dad’s truck, he was greeted by a formation of 1st MEB soldiers, standing at attention in front of a National Guard Humvee. After a moment, they all shouted “Happy Birthday, Brennan!,” and broke into applause. Brennan was speechless, according to his mother. “All he could do was giggle,” she said. Brennan and his best friend Kaleb were invited to check out the Humvee, and Brennan sat behind the wheel. Then soldiers took the two boys out for a spin. Afterward, Brennan and Kaleb put their heads out the hatch on the vehicle’s roof, while the crowd snapped pictures. But it wasn’t over. Brennan got out of the Humvee and was led to the front of the formation, where he shook hands with each soldier. He was inducted into the Army as an honorary member, then given a coin symbolizing merit and excellence, as well as a military jacket with his name on the pocket, and other Army-themed gifts. “Brennan, you exemplify what personal courage means,” Pfc. Kamesha Starkey, 1st MEB, told him. Finally, the mayor of Sulphur, La., gave Brennan a key to the city, and the title of Honorary Mayor of the Day. This is the most heart-warming article I have ever read. Very good.